A KD or Knocked Down hollow metal drywall frame (slip-on frame) is used for interior applications and comes in 3 pieces (strike jamb, hinge jamb and head). 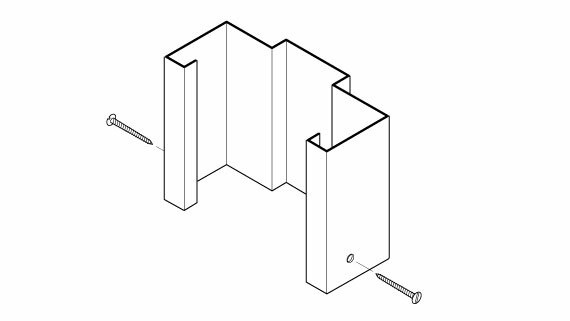 The KD drywall door frame is designed to be installed after the stud wall has been built and drywall applied, as it wraps the wall. For use with metal or wood doors. 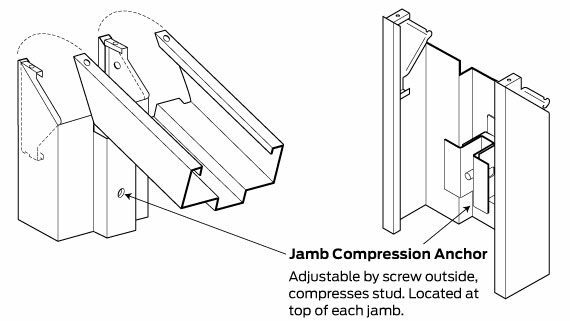 Standard Jamb Depths of 4-3/4" to 8-1/4"
5/8" 3-1/2" + 1-1/4" = 4-3/4" 5-7/8"
5/8" 5-1/2″+ 1-1/4" = 6-3/4" 7-3/4"
5/8" 2-1/2" + 1-1/4" = 3-3/4" 4-3/4"
5/8" 3-5/8" + 1-1/4" = 4-7/8" 5-7/8"
1/2" 3-5/8" + 1" = 4-5/8" 5-5/8"
5/8" (2 Layers) 3-5/8" + 2-1/2" = 6-1/8" 7-1/8"
5/8" 6" + 1-1/4" = 7-1/4" 8-1/4"
*Use #8 Phillips flat head sheet metal screws. If holes not included: Can be field prepped by drilling and countersinking holes.